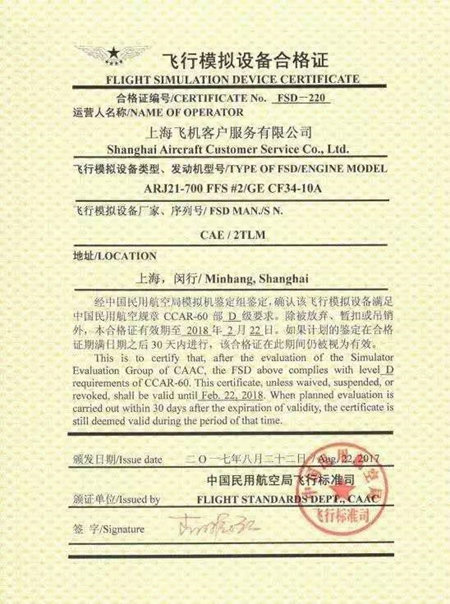 ARJ21 flight simulator obtains level D - the highest level certificate__Commercial Aircraft Corporation of China, Ltd.
A photo of the Flight Simulation Device Certificate. Recently, ARJ21-700 flight simulator passed the evaluation of Civil Aviation Administration of China (CAAC) and obtained level D - the highest level certificate issued by CAAC under CCAR-60. This is the first time for the flight simulator of the China-made aircraft to obtain this level of certificate and is also a symbolic achievement during the construction of civil aircraft operation support system in our country, which provides important guarantee for the batch delivery of ARJ21 aircraft and the cultivation of a large number of qualified pilots. ARJ21-700 flight simulator is a mockup simulator jointly developed by Shanghai Aircraft Customer Service Company (SACSC) of Commercial Aircraft Corporation of China, Ltd. (COMAC) and Canadian Aviation Electronics (CAE), wherein SACSC is responsible for development of engineering and flight test data packets, simulation and definition of failure mode, proof of comprehensive matching, etc., and CAE is responsible for software and hardware simulation platform and system integration. This is the first time to develop a flight simulator of the China-made aircraft completely in accordance with CCAR-60 and advisory circulars, and fills a number of gaps of China civil aircraft industry and China civil aviation in relevant fields. The development of ARJ21-700 flight simulator has broken through a series of key technologies such as simulator data packet development, flight test program preparation, flight test data acquisition, failure mode simulation and definition, and sound and vibration data acquisition, and the high-risk flight tests such as ground effect flight test and direct mode stall flight test are all the first attempts in the flight test history of China. 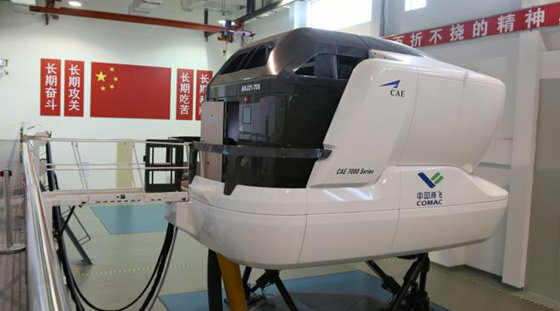 ARJ21-700 flight simulator passed the evaluation of CAAC and obtained level C certificate in December 2013. After that, the flight simulator undertook a great deal of work such as aircraft system scheduling, TC certification MOC8 test, flight training program preparation, instructor pilot cultivation and T5 test, cultivated the first batch of ARJ21 pilots for Chengdu Airlines before and after the first ARJ21-700 aircraft was delivered, and made great contributions to the research and development as well as the entering into service of ARJ21 aircraft. After the type certificate of ARJ21 was obtained and batch production and delivery configuration was determined, SACSC carried out supplementary flight test in accordance with relevant regulations, developed and froze final configuration data packet, and carried out software and hardware upgrade which lasted for five months on the simulator, making the simulator completely complies with level D requirements of CCAR-60 and finally pass the evaluation of CAAC, and thereby provide strong guarantee for the batch delivery of ARJ21 aircraft and the cultivation of a large number of qualified pilots. Level D flight simulator is the highest level flight simulation training device specified by International Civil Aviation Organization (ICAO), which can completely replace a real aircraft to carry out flight training and realize zero-flight-hour type training. This means that the pilot can fly ARJ21 aircraft directly on the route after completing type training on ARJ21 flight simulator. A photo of ARJ21-700 full flight simulator.